New evidence has come to light in the form a public information request from Shropshire Council. I attach a copy of page (No. redacted) Ref 8th May 2007 from which it is noted that my husband Denis Mackie and son Greg Mackie have a predilection for very young girls. It would therefore appear that the police does have information in relation to my husband and son’s activities, which has only just come to light. As you are aware, I have for many years been attempting to prove and uncover a systematic campaign of abuse of my daughter Hollie at the hands of not only my husband and son, but also other members of the community in the Aberdeen area. Though I have suffered physical abuse from my husband, which is recorded in hospital records and my doctors own records, I have never been able to prove against my husband or my son (other than lewd and libidinous behavior regarding my son), or any of their multifarious activities in this area. It would appear the police now have information, which refers to such activities. see below. I therefore wish to make a formal complaint against my husband and my son in relation to their peadophile behavior towards my daughter Hollie and for the police to investigate all matters concerning the same. Can you please acknowledge safe receipt of my letter and I look forward to hearing from you. 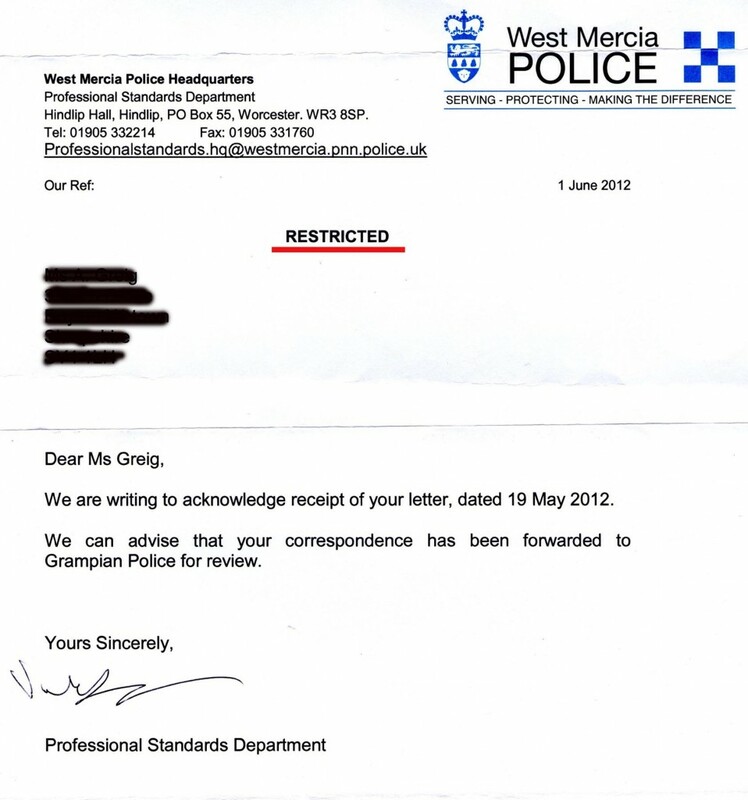 It has been brought to our attention that this letter, from the Professional Standards Department of West Mercia Police is breaking their own Professional Standards. This letter has no reference of any kind, which means that the complaint raised by Anne has probably not been logged, nor does the letter contain a name, only a signature, which effectively makes it an anonymous letter. Whilst this may appear to be knitpicking, it is very important that official documents are handled in the correct manner, follow established protocol and that those responsible for their generation are accountable and not merely able to pass the buck.